Are Customers a Burden to Your Employees? He is doing us a favor by giving us an opportunity to do so. When I ask workshop participants to think about this quote in terms of their own organization, they generally admit that, at some level, they often treat customers as a burden. Customers are, for many, an element of doing business that distracts them from their daily activities whether they are in operations, administration, IT or sometimes even marketing and sales. What is the most important element that business can control that makes it successful? What is the easiest way for a company to make money or lose it? What is the fastest way for a company to build its reputation? What is the fastest way for a company to destroy its reputation? They all know the singular answer – the customer experience. This answer comes intuitively. We are all customers of companies and we have all had bad experiences. Sometimes we feel helpless. Say in the case of an airline in your companies’ travel program that you would like to avoid but are mandated to fly. In other cases, we feel empowered and pull the plug on doing business with the company. Either way, for the company, the result is negative. Not taking the Customer Perspective: The most obvious reason is that we often don’t see the customer experience through the customer lens. We see it through the lens of operations and that perspective varies depending on where you sit in the company. Not Including Everyone in Customer Strategy: Employees who are not on the front lines likely don’t feel that the customer is actually part of their responsibility. Maybe they work in accounts payable or on the loading dock and rarely encounter customers face-to-face. Shooting for Average: Trying to please everyone, companies shoot for average and please only the few “average” customers. Providing Good Customer Service: When a company provides good customer service they can mistakenly feel that they have reach pinnacle of achievement when dealing with Customers. This is the hardest of the issues to correct because understanding that good customer service is not enough any longer requires a change in mindset. “The Customer is Always Right” is a phrase coined by Harry Gordon Selfridge, in 1909 and popularized by Marshall Field. Throughout the 20th century, resolving customer issues was the key to gaining customer loyalty and market share. Take, for example, the service focused approach taken by many retailers such as Nordstrom, Eddie Bauer, and L.L. Bean. Their commitment to service gave them a strong competitive advantage. These companies and other like them were the model of customer focused achievement until the Netflix, Amazons, and Zappos of the world started utilizing massive customer data and analysis to anticipate customers’ needs even before the customers understood them. They leapt over the competition by actually suggesting to their customers what they wanted, and so evolved beyond simply reacting to customer feedback to anticipating their needs and wants. Another success story of Customer Centric evolution is Spotify. Spotify farms data that enables them to personalize music selections based on customer preference and learned behavior. But Spotify’s success is not attributed solely to data and technology but also a culture created by hiring employees who are truly passionate about understanding their customers and music. But Customer Centric strategies are not limited to new internet and technology based products and services. My favorite example of a truly Customer Centric organization is Singapore Airlines. I lived in Singapore for several years and had the opportunity to fly them regularly. Yes… I said “the opportunity.” Even though I was often flying 10 to 19 hours on SIN flights, I was usually quite happy to be on the flights and even looked forward to them. Flight attendants never speak down to passengers. Whenever they can, they kneel next to you so that they are speaking to passengers face-to-face and using their names. When waking you before landing, flight attendants modulate their voices to bring you back in a pleasant manner. The entertainment collection is massive providing a large number of movies and television shows. I was introduced to some of my favorite TV programs on Singapore Airlines. The service people take note of your interests and patterns. Somehow, they got wind that I was a movie buff. Next thing you know, I received an invitation in the mail to a major movie premiere that they were sponsoring. When utilizing the Singapore Airlines credit cards outside the airport, not only did I get points but in stores all around Singapore, I received unexpected discounts or bonuses. This extended the experience beyond the flight. One of my worst experiences when I was traveling occurred when I would have to transfer onto a USA based airline after flying 18 hours on Singapore Airlines. I was in business class and asked for a cup of coffee. The flight attendant looked at me, sighed and brought me a sad cup in a Styrofoam cup. I went into cultural shock and still avoid this unnamed airline (which breaks guitars and drags passengers off) if at all possible. The gap between those who invest in a Customer Centric strategy and those who simply pursue efficient customer service is widening. Unfortunately most companies hit a ceiling when trying to achieve a true Customer Centric strategy. Without the precise use of data, supporting business operational changes and employee engagement, a Customer Centric strategy is simply a dream in the misty distance. Yet, with advances in technology and fingertip access to vast amount of customer data, companies only have themselves to blame if they get left behind. 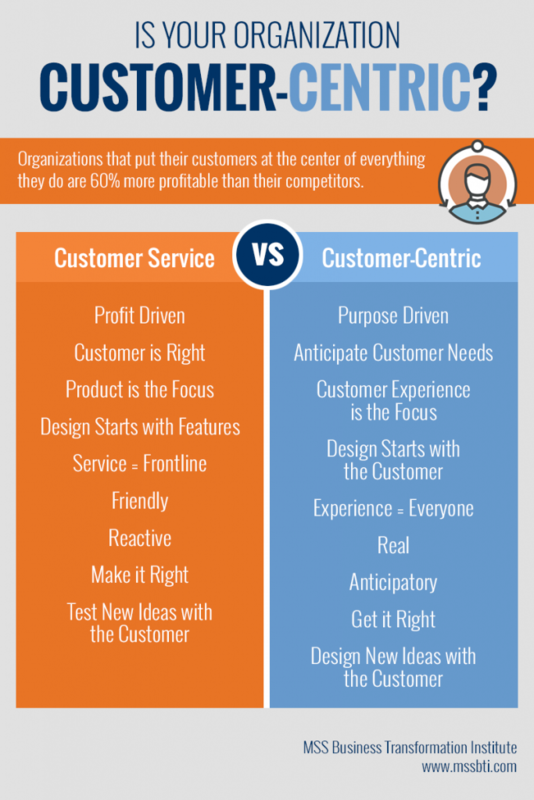 Is Customer Centric Worth It? Few companies would say that they don’t put their customer at the center of their strategy. Most semi-successful companies have a basic understanding of their customer’s needs and wants and attempt to service them well; however, the desire to focus on the customer rarely translates into an executable business strategy. But, people will never forget how you made them feel. But is it worth the effort? As a business leader you would justifiably want to know if the hefty investment will pay off big or if it will simply produce incremental results. A number of recent studies have answered that companies without an active Customer Centric strategy are leaving loads of money on the table and falling behind competitively. According to recent study conducted by Customer Care Measurement & Consulting, in collaboration with the W. P. Carey School’s Center for Services Leadership, $202 Billion in repeat sales are lost due to poor customer experiences. Meanwhile, companies with active Customer Centric strategies are 60% more profitable. Moreover, 89% of consumers who changed to a competitor did so because they thought the experience would be better. These results are not lost on the CXO’s of your competition, and if you are not on top of it, you are likely to be left in the dust. In fact, according to a 2015 Harvard Business Review study (sponsored by Strativity), 43% of organizations report that they plan to have a Customer Centric strategy in place in a year or less and another 31% plan to do it in two years while 63% of companies expect to spend more on customer experience. This means you may already be miles behind. The first thing to realize is that there is no halfway to Customer Centric. This is truly a holistic strategy that impacts all that you do. From your mission to your technology decisions to operations engineering to how you manage employee performance, a truly Customer Centric strategy permeates you organization. Most companies set to develop a sense of service in their organization. Behave well, solve problems, smile and have a great attitude are all normal instructions for front-line employees. But this is simply not enough. Often it can come off as fake. Creating a Customer Centric Culture is much bigger and much more in the heart of the people. It starts with creating a sense of purpose. Give them something to work toward that is bigger than themselves. This may be different in their view than their leaders’ minds. For leaders, being competitive, making money for shareholders, and perhaps serving their favorite charity is enough. For employees, they need to feel that they are contributing to a greater good in their daily tasks and activities. Almost all the data supports that this is a primary motivator above even compensation. So close that you tell them what they need well before they realize it themselves. Making sure that all employees feel that they are part of the customer experience even when they don’t touch the customer every day is a key step. This may take some work with individuals to understand and accept, but if they do, they will be more inclined to contribute and this carries over into their interactions. Creating this culture also means empowering them to drive customer solutions. Instill policies giving them real power and ensure that they understand what they have the opportunity to deliver. Additionally, give them the means to record customer feedback and relationship information. Usually only one or two employees per company have this ability. Open up the technology and train everyone how to input providing a 360 degree view of the customer. Train everyone, especially leadership, on how to interact with customers. This can be as simple as having them listen in and take customer service calls, or requiring a stint on the retail floor or having them attend customer management calls. Other possibilities are dependent on the situation, but once they have the experience with the customers, they have a stronger perspective on how to be customer focused. Sharing customer feedback is another way to familiarize everyone in the company with the customer’s needs and wants. Be transparent about it. Filtering how customers react to the products and services they receive only deadens the impact. It should not need to be mentioned, but include customer metrics into everyone’s performance plans. This can be specific to their role or on the broader customer satisfaction score. Even if their portion is just a small percentage toward their overall compensation, this makes everyone take notice. Finally, you need to BELIEVE in this effort. All leaders need to commit fully to a Customer Centric strategy and learn how to use the customer lens, or all of it will fall flat with your employees. If you asked a farmer in the 1890’s what he may want to make his life easier, he would have described everything that makes up a tractor but he would never have described a tractor. You may collect data on customer, but really matters is what solutions you develop with that data. I have sat through many marketing meetings where we are interpreting what people want and delivering to them after the fact. What a Customer Centric organization seeks to do is get ahead of the client and develop solutions they never anticipated. In other words, build the tractor. This sounds like it should be easy, but it is not. It takes a true commitment. All employees need to have the means to provide customer relationship input and be encouraged to do so. Of course, any data directly from the customer is highly valued and the most customer centric companies find a way to enable them to provide it willingly and voluntarily. Ask Netflix and Amazon who probably know everything about you by now. Then devise a means of extracting the data into a meaningful solution-building innovation process. Voice of the Customer is great example of a program that provides tools and methods to manage this. By aggregating all of this data and doing the right analysis, you will have the opportunity to also meet the needs of many, many types of customers in one felled swoop. What is important is that you never… never… shoot for solution to that takes care of the “average” customer. Raise the value of what you are providing. Your customers will come up to the level you set. The most challenging aspect of the Customer Centric concept for leaders is to see that continuous customer analysis and building great solutions does not work in isolation. 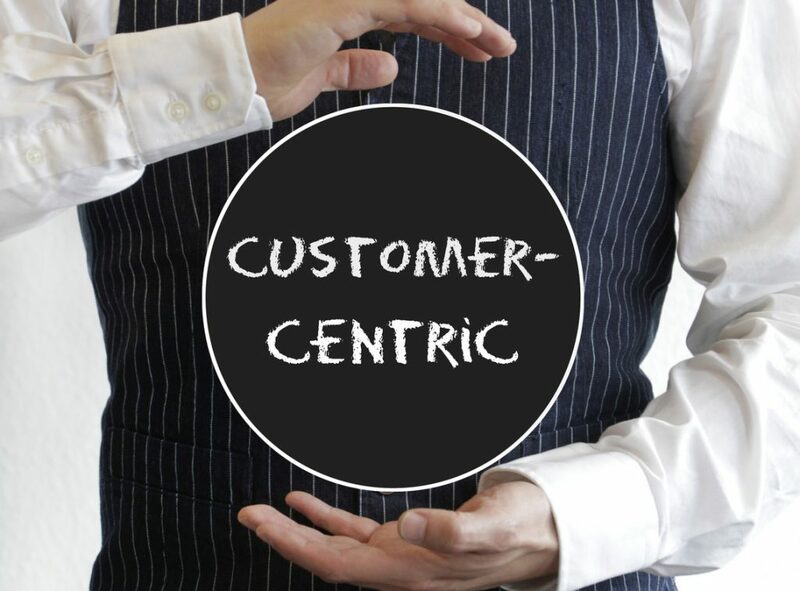 To really become customer centric, you must look at the operations of your business. Every part of the business operations needs to be tracked to a customer benefit. This is true of things that may appear to have no connection such as accounting, administrative regulatory or operations safety policies. If a customer benefit for the policy, process or system cannot be identified, the organization needs to consider whether it is indeed necessary? The next step is to determine how it can be reengineered to make the customer’s experience better. Can it be done faster? Can it be more transparent? Is this an opportunity to get feedback or input? Often, this can be achieved by testing the assumptions behind the process. I often do this with clients utilizing a “reversing the problem” approach. We ask ourselves, “How can we do this process/procedure/etc. in a way that makes the customer experience worse.” The answer often becomes clear that this is exactly the problem… it is already failing to take into account the customer’s view. Not asking these questions that test assumptions means that no matter what good is done on the front lines, the rest of the organization’s deficiencies will eventually clog up the works. I believe in peoples’ good intentions. I don’t think that there are businesses out there that are actually thinking, “We really want to deliver a poor customer experience.” There are those, however, that think that providing a good enough experience or an average level of customer service is all they need to do to be successful. Invest just enough not to lose the customer. Where they are losing the plot is that even good customer services is no longer enough. The demands of customers are changing and only the truly Customer Centric companies will win in the future. This means creating a culture of extreme customer focus, having the ability to collect data from a 360 vantage, and developing solutions beyond customer expectations. This can only be done by putting the Customer Centric approach at the center of your strategy and examining all process, procedures, and systems with the customer’s point of view. Process Visibility…Now You See It! Is Decision Fatigue Sucking the Life from Your Employees?